Indonesia's most active Marxist Party, the The Partai Rakyat Demokratik (PRD) or People's Democratic Party, has just got bigger. The spirit of unity filled the air as democratic organisations agreed to build a Party of National Liberation Unity (KP-PAPERNAS). Trade unions, student organisations, progressive political parties and poor people’s organisations agreed on a common platform and strategy at a conference on June 20-21. Participants agreed that imperialism and its agent in Indonesia, the government of President Susilo Bambang Yudhoyono, are generating the main crises across the nation. Neoliberal policies have plundered the country’s natural resources, devastated its national industry and impoverished its people. It has also removed the nation’s independence, sovereignty and dignity. People’s Democratic Party, the Automotive Workers Union, the Indonesian National Front for Workers Struggle, Unity of Workers Struggle, the National Student League for Democracy, Unity of Buddhist Student, the National Peasant Union, the Urban Poor Union and the Indonesian Transportation Workers Union. Joining at a local level are: Belawan Transportation Workers Union, (Medan-North Sumatra), Movement of the Poor, Labuhan Batu (North Sumatra), Lampung Street Vendor Union (Lampung Province), Jogjakarta Student Community, Solidarity of Indonesian Students, Amasutra, Lespek Boul, Central Sulawesi Union of the Poor, Forum of Lembata Youth (South East Nusa, NTT), Peasant Community of Rotanolet, Peasant Community of Liavua, Forum of Latena Community and People’s Alliance for Decent Housing. The new party will be officially launched on 23rd July 2006. Clearly an initiative of the PRD, the new party could be a major step forward for the Indonesian far left. The PRD itself was formed in 1996 and was originally led by Budiman Sujatmiko. Quickly and quite correctly labelled as "communist" by the Indonesian authorities the party endured severe harassment by the government and military. Budiman Sujatmiko, infuriated the government when he met Timor Leste pro-independence figure Xanana Gusmão and declared the PRD's support for the independence of East Timor. The PRD played a role in the 1997/98 anarchy that led to the resignation of President Suharto and supported leftist President Wahid (Gus Dur). The PRD is now led by union activist Dita Sari. The PRD and especially Sari have long standing ties to Australia's largest Marxist-Leninist group, the Democratic Socialist Perspective. 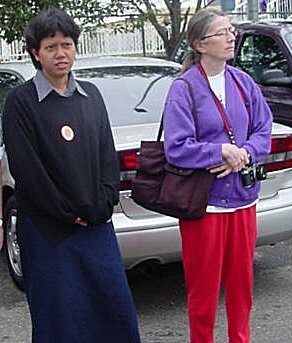 Dita Sari and US Trotskyite, Caroline Lund at the DSP's Asia Pacific Solidarity Conference in Sydney, 2002. The PRD is also closely associated with several "national liberation" and Marxist groups in the Asia/Pacific region, including the Timor Socialist Party. "The PRD played a role in the 1997/98 anarchy that led to the resignation of President Suharto and supported leftist President Wahid (Gus Dur)." Yes popular uprisings against dictators are anarchic aren't they? Suharto was such a nice man wasn't he? He just killed... a million people or so.